.......It's the nicest location I've seen a skate park in and the best skate park I've seen. 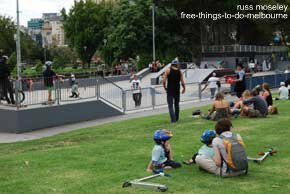 Take a stroll along the river outside the historic boatsheds while your kids do their boardslides, kickflipping or mongos! ........otherwise there's a little cafe building you can sit outside to keep an eye on them. 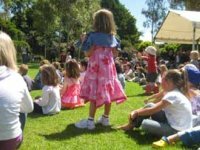 .........It's fully staffed too so it's a safe place for your kids to be. Scooters, bikes and skateboards are all allowed. ..........It was apparently designed by skaters though and no doubt your kids will know the terms. It certainly looks good to me from a spectator point of view and I've been down a drive on a skateboard twice so I have some experience! You can hire equipment but this isn't free. 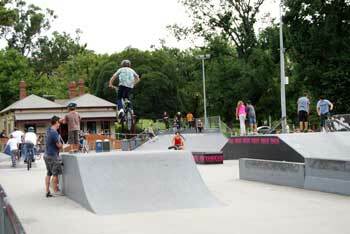 You'll find this skate park in Alexandra Gardens by the Yarra River over the bridge from Federation Square. ........On Wednesday and Friday nights the park is floodlit till 10.30pm except in winter and weather permitting.